This small aluminum part has sharp edges all around the sides. This was due to the aluminum cutting process to create it. Giving this, the customer needed to remove sharp edges and small burrs from this aluminum extrusion part. 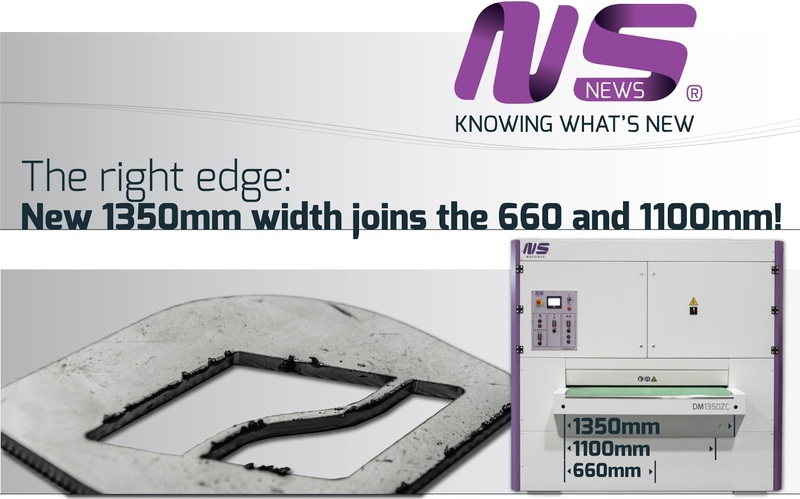 NS DM1100 C edge rounding standard machine for edge rounding of metal sheets and small parts was the solution found for the edge problem. Due to the shape of the aluminum part it was not possible to put it in a straight position. In combination with guides on the top side of the conveyor table was enough to guarantee that the parts would be in the vertical position. The cross belts system combining two belts running in opposite directions are enough to deburr and remove sharp edges from this small part. The final result is a smooth edge due to the edge rounding process. In combination with a special parts return system, the operator fed the parts in the table and then passes through the return system. After the inspection, the operator flips the part in order to deburr the other side. The parts return system enables the machine to operated with just one worker instead of several. One of the most known cutting processes for metal sheets is plasma cutting. This process uses a high velocity jet of ionized gas heating the workpiece and cutting by melting the material. 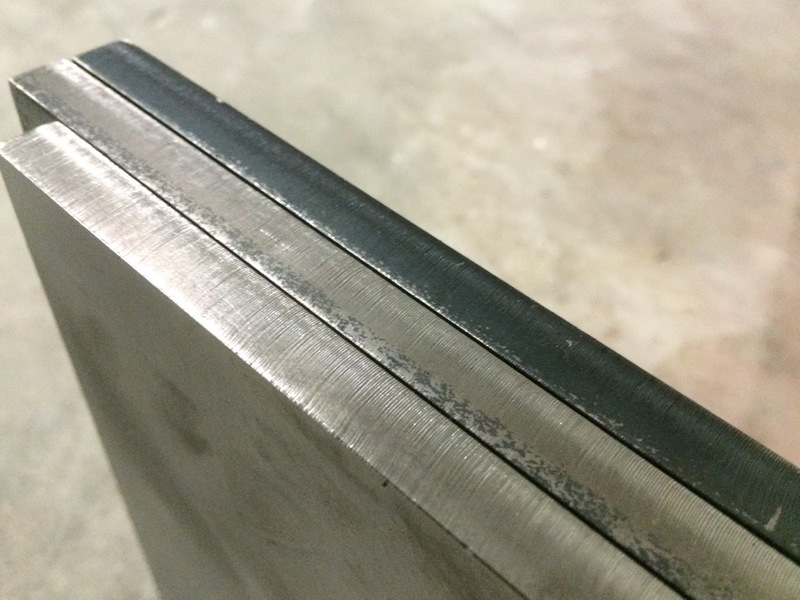 Despite being a very economical and fast process, for thick metal sheets it has a big downside: big burrs. Since the metal is melted, the top of the part has a clean cut but on the other hand the bottom remain with the burrs of the melted material. These burrs are, in most cases, undesired because changes the piece sizes and specifications. In order to be used on the final process, companies need to remove the burrs by implementing a deburring and edge rounding solution. NS Máquinas developed the DM1100 ZC - Deburring and Edge Rounding Machine specially to remove medium and big burrs and perform the edge rounding in the same process. In order to do this, this machine, includes a deburring station with an abrasive belt and a large contact roller. Also, it has a double cross belt station with two belts running in opposite directions enabling the edge rounding. This piece has severe burrs on the bottom part and the costumer needed not only to remove it as well edge round and finishes the piece. After the deburring station the burrs were totally removed from the bottom surface. Also, giving the flexible cross belt abrasive blocks the edges of the part were soft and round. For more information please visit our website: www.nsmaquinas.com or contact us at marketing@nsmaquinas.com. DM1100 2C cross belt edge rounding machine deburrs the two sides of the part in one single pass. It removes sharp edges on both external and internal contours of stainless steel, steel or aluminium parts either cut in laser, shear or punching machine. This deburring machine has two stations with double cross belts for edge rounding, leaving clean, soft and burr-free edges on the complete parts. The touchcress control enables single side or double side operation modes and automatic cross belts replacement position. See more of this machine on the video below. 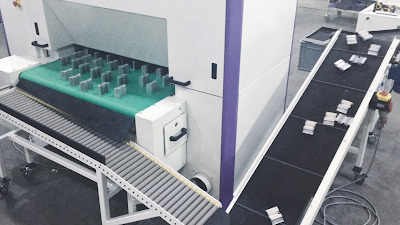 DM machines with ZC configuration, combine deburring and strong edge rounding in one single machine, processing small and large parts cut mainly on laser and plasma. The large diameter contact roller deburrs efficiently small and medium size burrs while the 2 counter rotating abrasive cross belts leave a soft edge both on the internal and external contours of the parts. Now, DM ZC machines are available in 3 working widths (660, 1100 and 1350mm) being able to better suit each company production range. Since the 2 stations have an independent construction, these machines enable the work with 1 station only as well. Making a soft edge on burr free laser or punched cut parts or supplying a linear finish on metal sheets is possible with any of these versions. Small parts down to 50x50mm deburring and edge rounding is one of the big strengths of this machine. 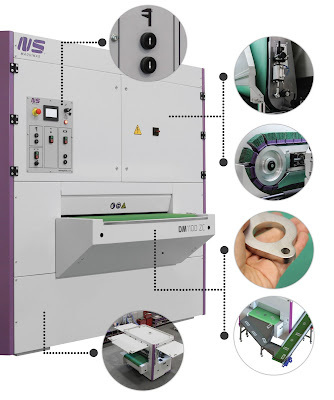 More, this line of equipment can be fitted with parts return systems and support roller tables increasing productivity both on small and large parts processing (available from NS Máquinas). The integration with these devices is made easier due to the fixed conveyor belt working height design. For more information please visit our website: www.nsmaquinas.pt or contact us at marketing@nsmaquinas.com. DM1100 CT is a single side cross belt machine which removes oxide layer from oxygen laser cut steel parts both on the inside and outside areas. Also, by replacing the cross belt set for edge rounding type this machine can remove sharp edges of stainless steel, steel and aluminium parts cut by laser, punching or shearing. This deburring machine can work parts longer than 180mm and as a table with 1100mm width. 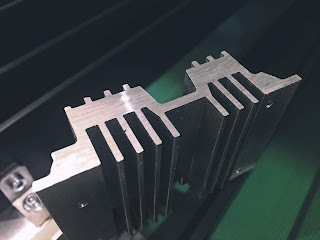 For smaller parts edge rounding please contact us for our DM1100 C.
Principle of work: 2 v-belts with abrasive blocks or oxide removal wire brushes running in opposite directions guarantee that all sides on the top surface and upper half thickness will be cleaned from oxide or edge rounded in one single pass. Oxide Removal: removing oxide layer from thickness of steel parts up to 8mm in one pass or up to 16mm in 2 passes. Cleans simultaneously internal holes. DM660 ZPK is a deburring machine for sheet metal and parts cut by punching, shearing, laser or plasma. DM660 ZPK features an integrated vacuum table and a 3 movement system of the brushing head, assuring a high consistency. It is possible to work parts up to 660mm width and some as small as 50x50mm. This machine can perform rounding on small holes, bended plates and create big radius up to 2mm. 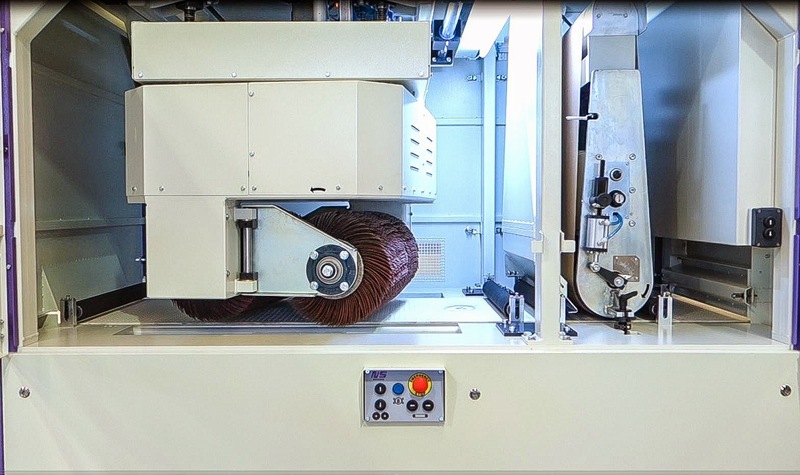 By blocking the rotation head this machine can be used for surface finishing in a configuration of wide belt and double parallel brush. On DM660 ZPK it is easy to interchange brushes, so it is possible to achieve rounded edges free from burrs or sharp corners but also to clean oxide layer. When operating with steel planetary brushes DM660 ZPK removes efficiently the oxide layer on interior and exterior contours of laser-cut steel sheets. DM660 ZPK cleans oxide layer in 2 step operation on parts from 4mm up to 25mm thick. Preparing steel cut parts for coating by removing oxide layer will improve the ability of the parts to be coated. Powder coating or wet paint adheres well to the oxide layer. However, when the surface is damaged or subject to impacts the oxide layer can detach from the material, limiting the lifetime of the coating. DM660 ZPK performs oxide removal with flexible and efficient wire brushes, leaving the parts oxide free and ready for further coatings. See the demonstration video below of this oxide removal machine where steel parts are brushed from oxide. 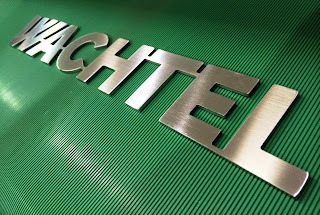 Foekema Plaatbewerking BV is a Dutch company specialized in metal sheet services and fabrication. 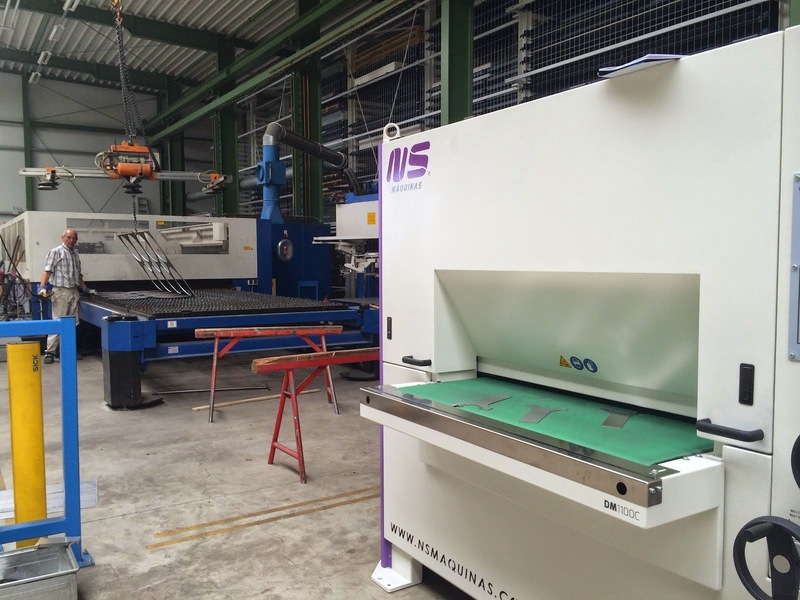 The company which provides laser cutting, welding and engineering services has just purchased an innovative corner rounding machine from NS Máquinas. 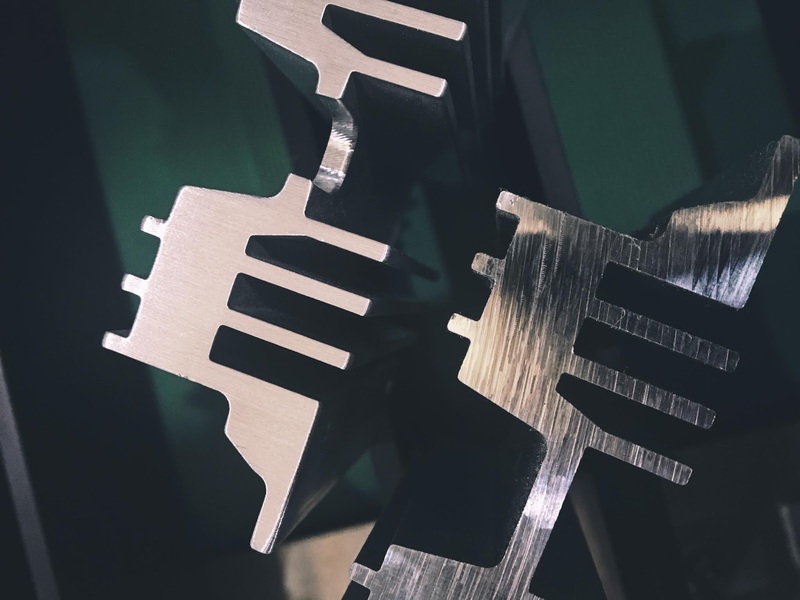 The need for a metal deburring machine was due to the increasing demand in the food industry, where customers like rounded and burr-free laser cut parts, both for hygienic reasons and also in order to eliminate the risk of injury with laser cut sharp edges. On the other hand customers demanded steel parts with rounded edges to assure better adhesion of powder coating and zinc layers. For these reasons Foekema decided to move on to the purchase of the NS Máquinas deburring and edge rounding machine DM1100C. DM1100C edge rounding machine can also deburr stainless steel laser cut parts with plastic foil, leaving the surface untouched. “Parts which were laser cut with film protection are not a problem. The film remains tight and the contours are rounded”. This metal sheet edge rounding and deburring machine has a maximum width of 1100mm and works up of 50mm thickness. The DM1100C metal deburring machine has a cross belt edge rounding technology because the machine is equpped with two transverse belts. These cross belts have sanding blocks which consist of abrasive flaps with scotch brite. These abrasive tools are designed to provide the removal of the burr and edge rounding of the corners. At the same time the cross belts provide a nice finish, especially in stainless steel. 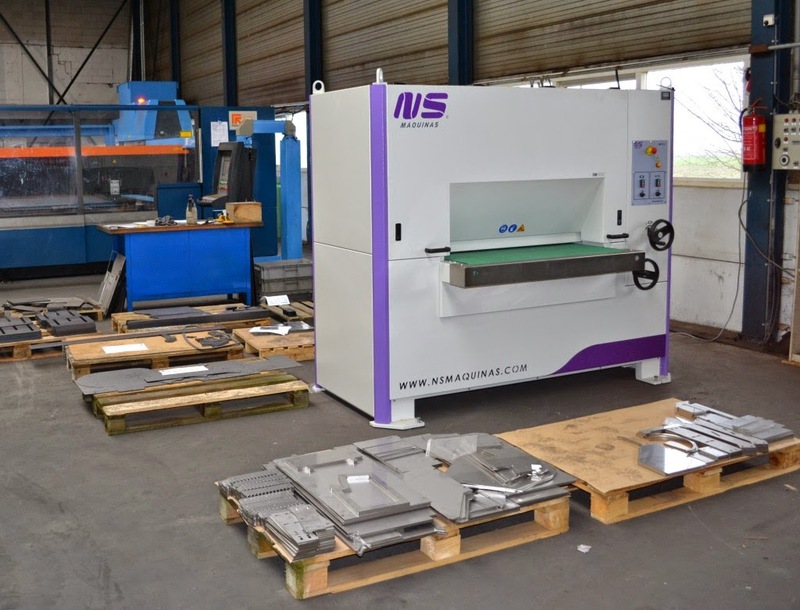 Regarding the investment on the NS metal deburring machine Foekema has no doubts and concludes “a relatively short operation time with low processing costs”. DM1100 C is the ideal machine for creating rounded edges on metals parts with light burrs. This machine is equipped with a double top cross belt with deburring abrasive blocks which work all edges of parts regardless its shape. 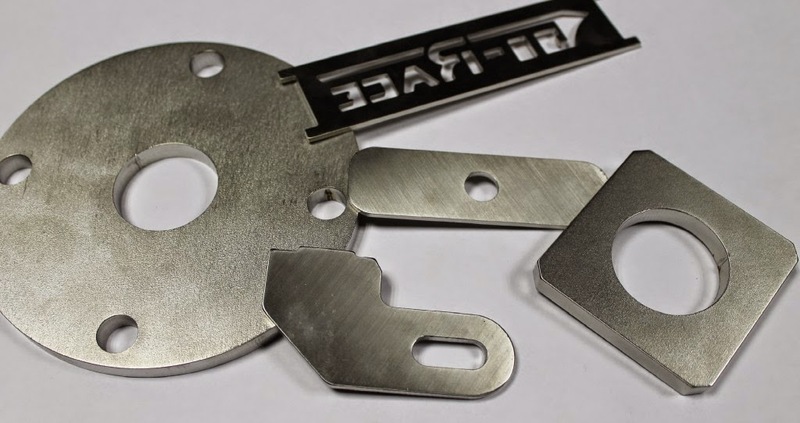 This technology provides a strong rounding action on parts cut on laser and deliver a high performance in any size of part, including parts as small as 50x50mm. The action of the abrasive blocks, besides creating a perfect rounded and deburred edge, creates a smooth linear polished finishing. Having the possibility of polishing stainless steel laser cut parts with a very fine touch is great benefit on several applications where aesthetic is important. Easy and measurable set-up of thickness and pressure and quick replacement of abrasive cross belts (less 3 minutes) are some of the extra benefits the DM1100 C deburring and edge rounding machine brings. This product is available in 1100mm and 1600mm max. width capacity (models DM1100 C and DM1600 C) and can edge round laser cut parts but also other parts with light burrs such as parts cut on punching, shearing or plasma machine. Contact us at marketing@nsmaquinas.com or visit www.deburring.nsmaquinas.com to know more about these metal sheet deburring and polishing machines. 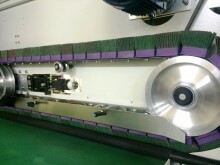 DM edge rounding machines are available with deburring station before the cross belts. The soft contact roller Ø240mm can grind away burrs from laser and plasma, while the cross belts will remove sharp edges, rounding them with extreme efficiency. These machines can actually work parts down to 50x50mm. The stations are independent. This makes possible the operation only for edges rounding (without abrasive belt) and only for parts finishing in a second step after deburring and edges rounding. These models count with fixed working height, motorized control of thickness and cross belt pressure/wear. The cross belts are positioned at 35º, which permits the use of the full width of conveyor belt. Parts will not be placed at an angle as it is done with DM1100 C. More, we can have a straight finishing after edges rounding if a 3rd station is required (abrasive belt or brush unit). This machine is available in 2 sizes: working capacities of 660mm and 1100mm (DM660 ZC and DM1100 ZC). DM660 ZPK is a deburring and edge rounding machine for sheet metal and parts cut by punching, shearing, laser or plasma. Removing burrs and creating round edges using planetary brushes technology is possible on parts up to 660mm width and on some as small as 50x50mm. 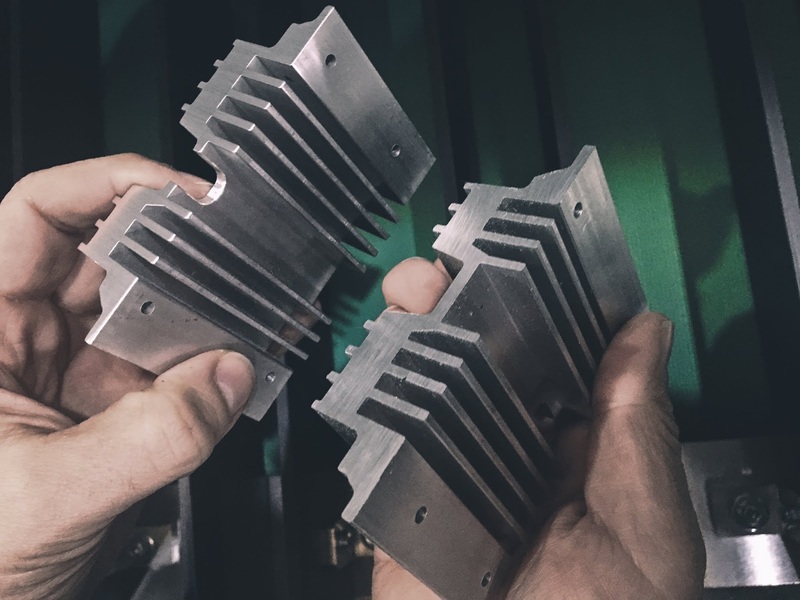 Inside and outside contours of stainless steel, steel and aluminium parts cut by laser or other thermal processes are burrs cleaned from the total surface. 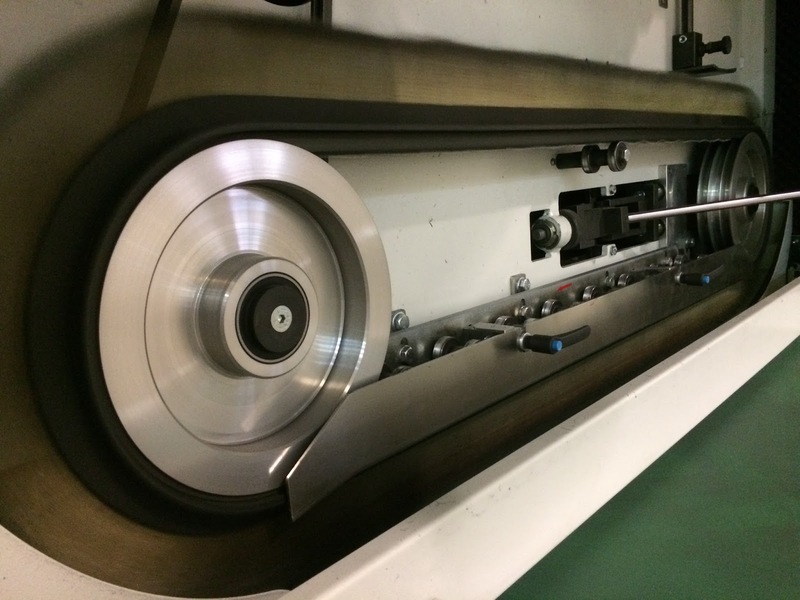 DM660 ZPK features now an integrated vacuum table, a re-designed conveyor belt with higher holes density for smaller parts deburring and a 3 movement system of the rounding head, assuring a higher consistency of the parts processed. Metal sheet deburring, laser cut parts edge rounding, removing burrs and sharp corners and creating soft edges are operations easy to achievable with DM660 ZPK abrasive deburring machine and demonstrated on the video below.